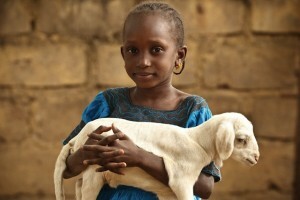 We examine the flaws in concept and practice with animal-gifting groups in general, and with Heifer International in particular (since they are the largest and most well-known). Animal gifting programs promote dairy production in populations that are largely lactose intolerant. Increased dairy production is frequently touted as one of the greatest successes of animal-gifting programs. However, 75% of the world is lactose-intolerant, and 90% of Asian and African populations (toward whom dairy programs are aggressively targeted) are lactose intolerant. As such, both small- and large-scale dairy programs negatively affect the health, wellbeing, and productivity of people in lactose intolerant populations. Additionally, dairy production negatively impacts local communities with ripple effect consequences that ultimately disadvantage entire societies. Lactose intolerance occurs when there is not enough of an enzyme called lactase. Because of this, raw milk still poses problems. The result is widespread digestive ills such as stomach pain, gas, bloating, cramps, diarrhea, and even vomiting. Consuming milk from other animals is also associated with allergies, asthma, and a host of autoimmune disorders. Most mammals (including humans) become lactose intolerant after weaning. Milk is very specifically created for infants, not adults. Furthermore, there is no need for humans to consume the milk of other animals. Logically, this makes sense but rarely is it fully considered. While dairy is “a” source of calories, the resources used to produce it may be better spent on alternatives that provide a higher quality and quantity of calories, protein and calcium. A typical dairy factory farm. Wikimedia Commons. While animal-giving programs seem to focus on small-scale farming, they have extremely large-scale implications that pave the way for factory farming, and exponentially increase consumption of meat, dairy and eggs throughout entire countries and beyond. For example, Heifer International is largely considered responsible for kick-off of industrialized dairy in Japan after World War II. Heifer International boasts that their projects produced 3.6 million gallons of milk in one year in Uganda, and developed a national dairy program in Tanzania. These massive programs were developed despite the fact that 90% of Asian and African populations are lactose intolerant. Pro-meat biases mean that sustainable plant crops that actually provide better nutrition and more income are often overlooked. Teff, for example, is one of Ethiopia’s oldest grains. It is drought and heat tolerant, while also being packed with protein and calcium. In Food Choice and Sustainability (2013), Dr. Richard Oppenlander writes: “In Ethiopia, over 40 percent of the population is considered hungry or starving, yet the country has 50 million cattle (one of the largest herds in the world), as well as almost 50 million sheep and goats, and 35 million chickens, unnecessarily consuming the food, land and water… [P]oorly managed cattle grazing has caused severe overgrazing, deforestation, and then subsequent erosion and eventual desertification. Much of their resource use must be focused on these cattle. Instead of using their food, water, topsoil, and massive amounts of land and energy to raise livestock, Ethiopia, for instance, could grow teff, an ancient and quite nutritious grain grown in that country for the past 20,000 to 30,000 years. Teff…is high in protein, with an excellent amino acid profile, is high in fiber and calcium, (1 cup of teff provides more calcium than a cup of milk), and is a rich source of boron, copper, phosphorus, zinc, and iron. A starving cow scavenging trash during 2011 drought in Kenya. Photo: creative commons/ Andrew Heavens. While tempting to believe, farmed animals do not just “live off the land” consuming only grass and scraps that don’t compete with human consumption. In response to criticism that promoting animal agriculture in regions already plagued by desertification and drought is irresponsible, Heifer International and other organizations have “zero-grazing” requirements. Unfortunately, zero-grazing means that confined animals must have food and water actually brought to them. This food and water can be in direct competition with human consumption. Animal gifting groups promote water-intensive animal farming in areas already suffering from water scarcity. Creative Commons. Raising animals for food requires up to 10 times more water than growing crops for direct consumption. Mama Hope drip irrigation project in Kenya. With micro-irrigation, crops can be grown year round, harvesting rainwater and precisely redistributing it, and supplying families with sources of food as well as income from surplus harvest. Goats drinking water in Kenya. Photo: creative commons, flickr Oxfam. Boy tending goats in Tanzania. Photo: creative commons, flickr user David Dennis. 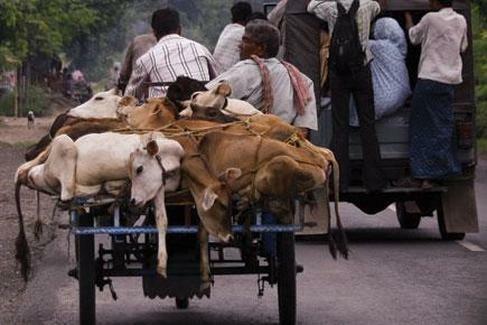 Cows being transported to slaughter in southern India. Photo: Climate Healers. And finally, the animals are far from happy. Many gifted animals suffer from confinement, neglect, malnutrition, and lack of protection from weather and temperature extremes. Animals also endure horrific slaughter processes and long distance transport to and from the recipient’s location. Concerns about the priorities and appropriate use of donations apply to all animal gifting programs, but Heifer International raises particular concerns because of their annual budget which exceeds $100 million a year, and luxury spending such as on their headquarters pictured here. In 2012, Heifer International spent more than a million dollars on professional fundraising fees. That figure jumps to more than $22 million when printing, distribution, processing, and other fundraising-related costs are included. According to Heifer International’s most recent 990 public tax form, they spent $22,359,441 on fundraising alone in one year. See other 990s. Is this where your donation is really going? Is your donation paying for fancy buildings and expensive glossy catalogs that are shipped to tens of thousands people who don’t even request or want them? As explained in the earlier section, any donation can be used “where needed most.” This includes Heifer International’s massive fundraising budget. Due to popular demand, A Well-Fed World created a special Plants-4-Hunger gift-giving program to provide a compassionate and highly-effective alternative. A Well-Fed World sends 100% of your donation to four hand-picked groups with low-overhead and proven successes in high-need areas. These hunger relief projects provide both immediate assistance and long-term community solutions that feed families without harming animals. We make it easy with one tax-letter, gift card and present, but you may also choose to give directly to these groups or choose from our grants list.